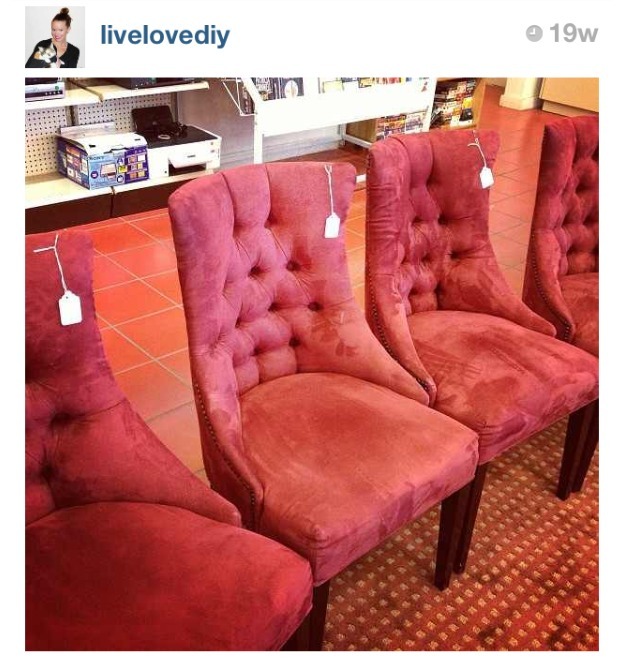 By now, most of you reading my blog know that I love thrift stores. My thrifting began out of necessity, but over the course of the past few years, it's truly become something I do for fun. I realize I'm kinda weird, and I'm cool with that. Thrifting is basically a beautiful synergy of my two favorite things: decorating and treasure hunting. 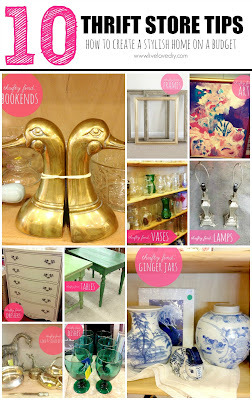 I've been a thrifter for so long now, that when I need something for our house, I almost always try to thrift it first. It's really hard for me these days to spend the big bucks on something at the real store when I know I can put in a little extra effort and find something I love for $5 at the thrift store. That being said, I can't find everything I need at a thrift store. Some things have to be new. Like my couches, my mattress, and my toothbrush. But, I've learned that I can buy what I need to at retail, and then fill in the gaps at the thrift store. Thrift store's got gaps, I got gaps, together we fill gaps. So, today's post is about the 10 basic home decor items you can find at thrift stores. 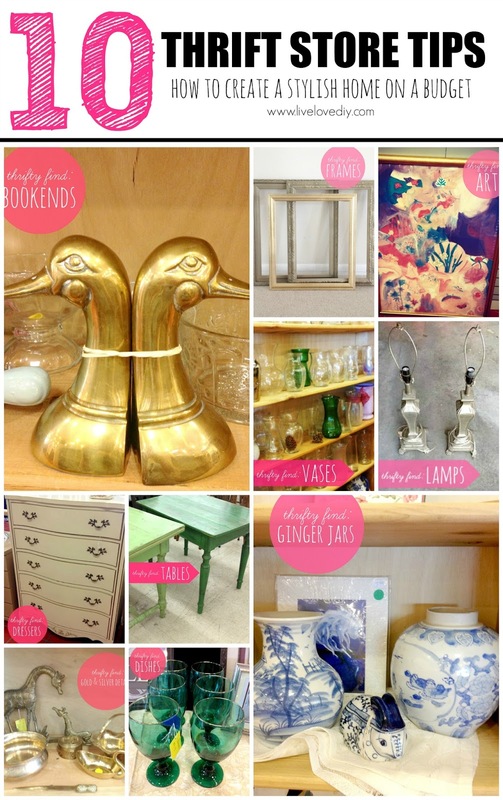 Before we start, you need to know that the thrift stores in our area aren't anything special...at all. They are absolutely filled to the brim with junk nobody wants. 99% junk, 1% awesome. The key is frequency. I have about 5 local thrift stores I like, and I try to check them out once a week. I've been gathering photos for this post for over a month, so I didn't just walk in one day and find all this stuff at once. It took a lot of time. This post is to show you that the good stuff exists. So, if you get discouraged because you're coming up empty handed in your thrifting adventures, don't give up. You've got what it takes, girl. Now that we're done with the pep talks and prefaces, let's get started with the 10 basic items you can find at thrift stores. I'll give you some ideas of what I would do with each one, but the possibilities are truly endless. Dressers are a great item to thrift. I usually see 2-3 dressers every time I go to our local thrift stores. Most of them aren't anything special, but every so often you can find an amazing one for $50-$100. Here are a few great examples that I found. I love this french provincial dresser. It's like the sassy little sister to my older and wiser bedroom dresser. 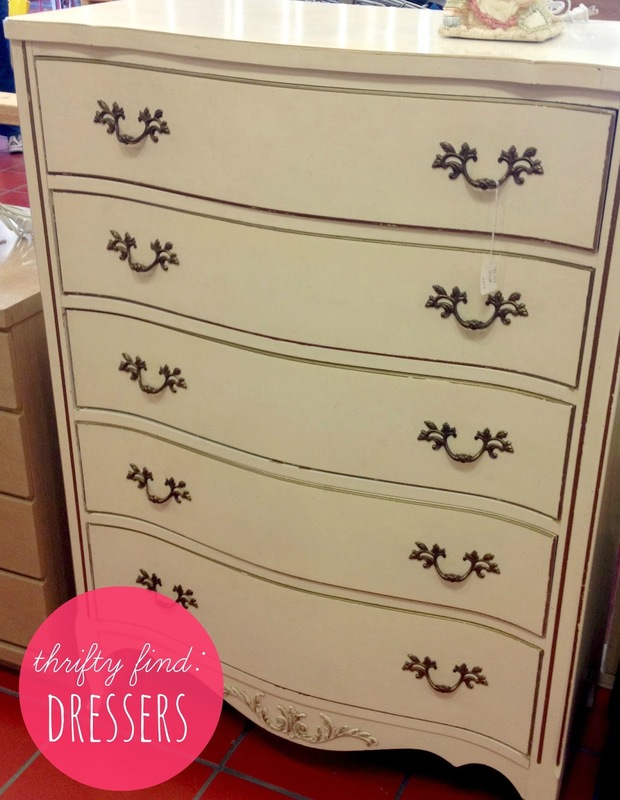 This dresser would look amazing in distressed dark grey chalk paint with the existing hardware spray painted gold. 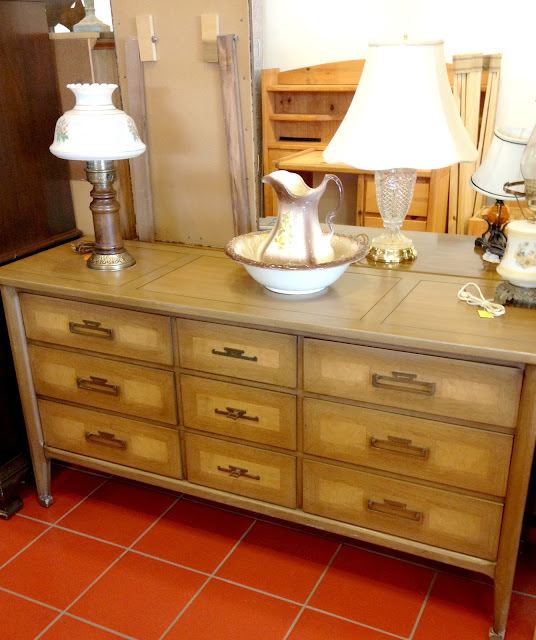 This mid-century modern dresser would be gorgeous in a fun color (maybe coral or aqua), with the existing hardware spray painted gold or silver. I love the wheels on it, too. Just squint your eyes until those lamps disappear. When buying a thrifty dresser, find one with a classic shape in decent condition. If it has any imperfections that I can easily fix (like scratches that need wood filler or a loose leg that needs a new screw) I will overlook them if the price is right. When thrifting, I try to remember that I'm not buying my next family heirloom. I'm just looking for affordable furniture that I can make look awesome in the meantime. To see the thrifty dressers I've redone, see here, here, or here. 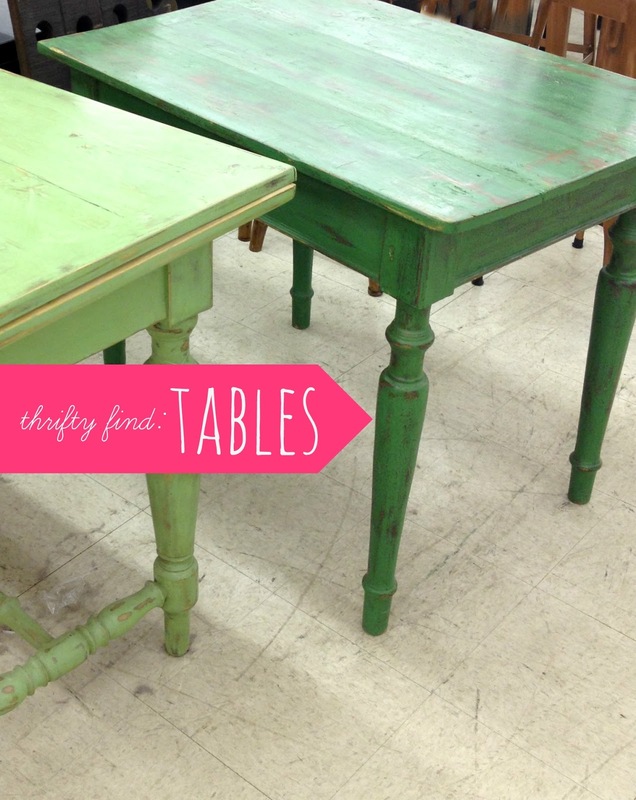 Whether it's desks, end tables, or dining tables you're looking for, you can find them at a thrift store. Here are just a few great options I found over the past couple months. These distressed green end tables are super cute for $20 each. I love that they are a slightly different shape and color. This next table has seen better days, but if you can look past what's there, you'll see that it has great legs and would look great with a little paint and glaze. Also, I may have thought the candleholder was a giant salt shaker at first. I blame that picnic basket. This next one was in much better condition, with barely a scratch on it. I don't love the wood color, but I feel like this one has some potential, too. 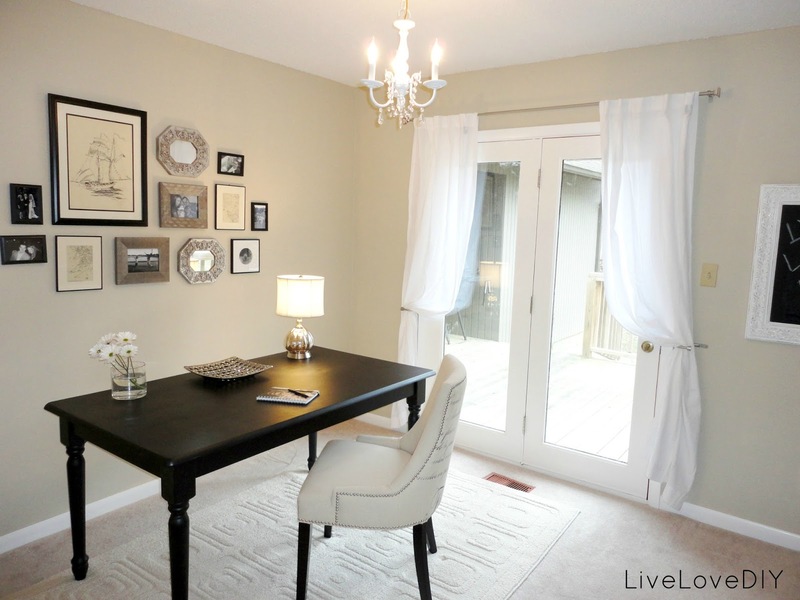 It has a sleek, modern shape that would look great painted with some shiny lacquer. This next table was a great find. I don't love the chairs, but I think you could update them a bit by re-upholstering them with some bold fabric (Navy and white stripes, perhaps?) I mostly just like the pedestals on the table. The table could be great if paired with different chairs. 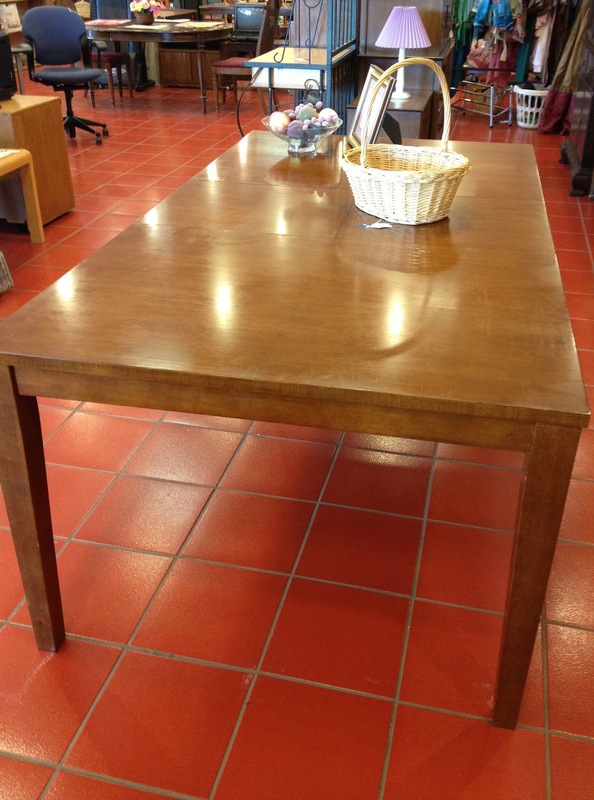 I also think just using one of the pedestals as a base for a round table top would be great, too. 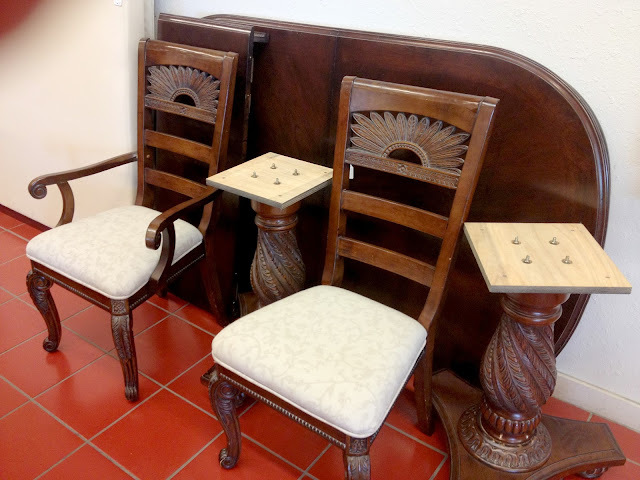 The entire set with 6 chairs was under $150, which still makes it a great deal. 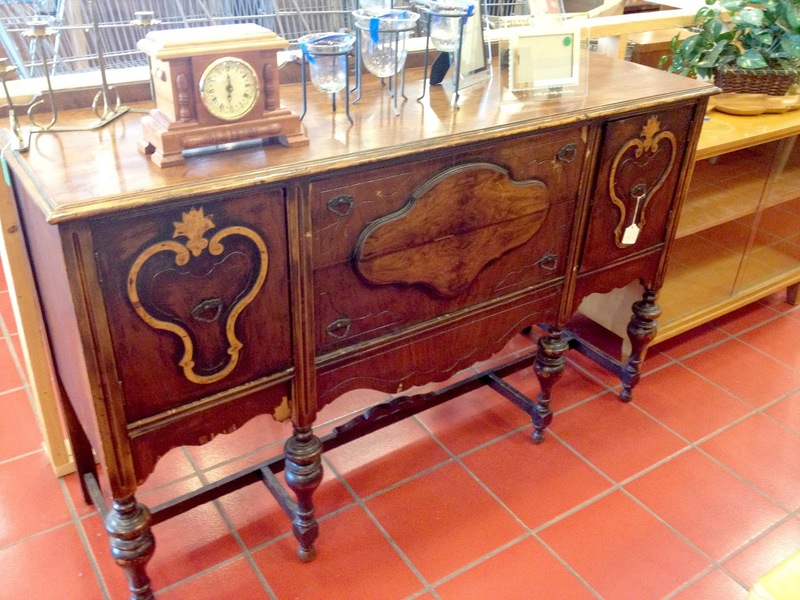 Sideboards and armoires are a little harder to come by, but when I find one, they're usually pretty great. I recently came across this one, which may have been the coolest one yet. Finds like these are pretty rare, but they do happen. 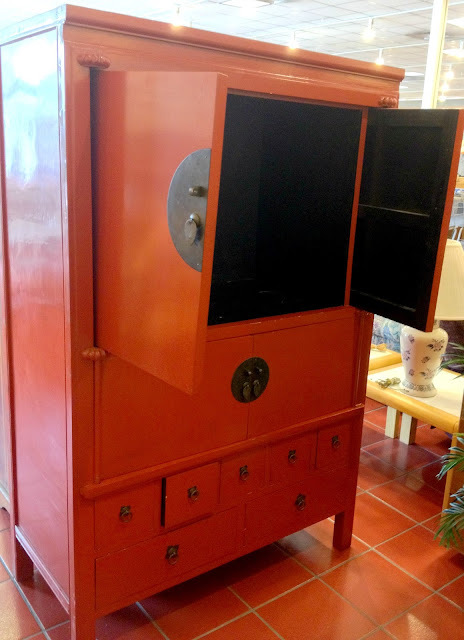 This was such an amazing find, and I would paint it bright green or blue, or even yellow. Although, the red is great, too. As awesome as it was, I just didn't need it and had to walk away. It's super easy to become a hoarder if you thrift a lot. Over time, I've pretty much figured out how to avoid those hoarder purchases. If I have to stop and think about an item, I need to walk away. You should only buy the stuff that makes you jump up and down when you find it. Every time I have to pace around and think about something, I end up regretting the purchase later. Learn to trust your thrift gut. This sideboard was also pretty cool. It would require some work, but you could easily re-coat it or paint it. I come across chairs all the time at thrift stores, which may have been evident by the fact that I've redone over 10 of them. If you follow me on Instagram, you may have seen when I happened across some totally awesome red tufted chairs at a thrift store for $15 each. I'm sure these were scooped up within the hour, as they looked to be brand new. It's as if the universe is telling me to decorate with red. I'm ignoring him for the time being. Thrift stores are a great place to find old wooden headboards. I painted an old wooden headboard for our guest bedroom and it was a cheap way to create a nice place for our guests to stay. The larger headboard in the picture below would be pretty cool if painted. The small one is straight from a 1980's beach condo, but its curved shape would make a great base for an upholstered twin headboard. I try to look past what's there and think of different ways things could be used. Thrift stores have old lamps everywhere. I think they reproduce after they get there. All you need is a few coats of spray paint and a modern drum shade, and you have a great looking lamp for way less than you would pay for elsewhere. Most of the time, I just find a single lamp by itself. That quickly becomes a hoarder situation, and at one time I had 5 lonely thrift store lamps just waiting for the soulmate that never showed up. These days, I've learned to hold out for a pair. The below lamps were a great find. You could keep them as they are, or spray paint them to complement your decor. The below lamp has a great shape, especially for $5. It could be easily updated by spray painting the brass a brighter gold, and spray painting the red part a different color (like aqua, emerald, or white). You could also just paint the entire thing. Add an updated drum shade and voila! 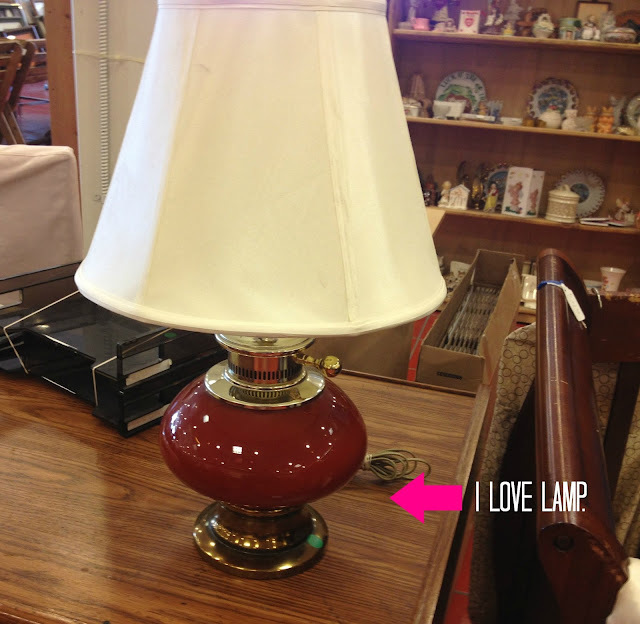 See my thrifty little lamp makeovers here and here. 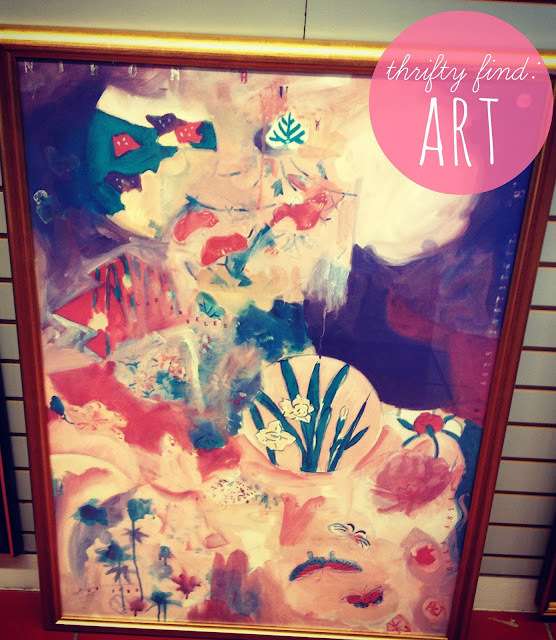 Thrift stores are a great place to get cheap decor for your walls. However, you have to be willing to do a little work. The below mirror looks pretty outdated at first glance. But, imagine it with the frame spray painted a bright gold, or even a glossy turquoise or red (Just because I don't decorate with red doesn't mean I can't appreciate red done right!). For $10, that could be a total statement piece. I posted about this next piece on my Instagram a few weeks back. I'm sure everyone thought I was a crazy at first, but I had a plan. I got this giant 5 foot tall print for $5. I doubt I will ever use the bold print that's in the frame (although I will save it in case I ever want to do something with it), but the real reason I bought it was for the giant frame. I'm working on a giant painting for my office, and this giant frame is the perfect size. It would be nearly impossible to find a frame this massive and this nice for $5 elsewhere. Although, it's been sitting in my office as-is for a good month now, and it's kinda growing on me. I need to finish my painting asap before this thing weasels its way onto my wall. I think it's glamouring me. These days, I get almost all of my frames from thrift stores. Most of the time I find frames with mats and spray paint the mats (like I did here), but there are times when I buy thrift store art just for the frame. 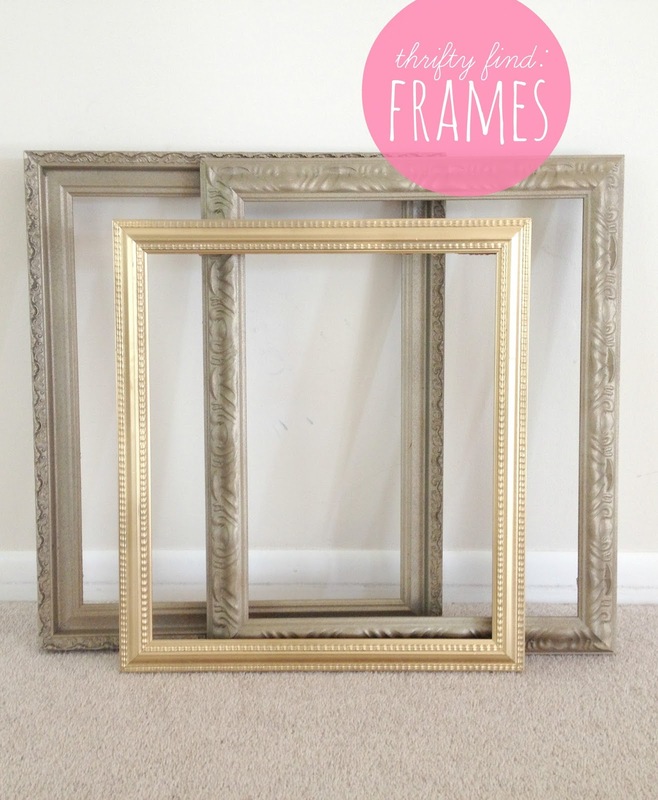 I'm working on a project right now and these little $1 thrift store frames will be put to good use. They were originally wood-tone, but I've since spray painted them. 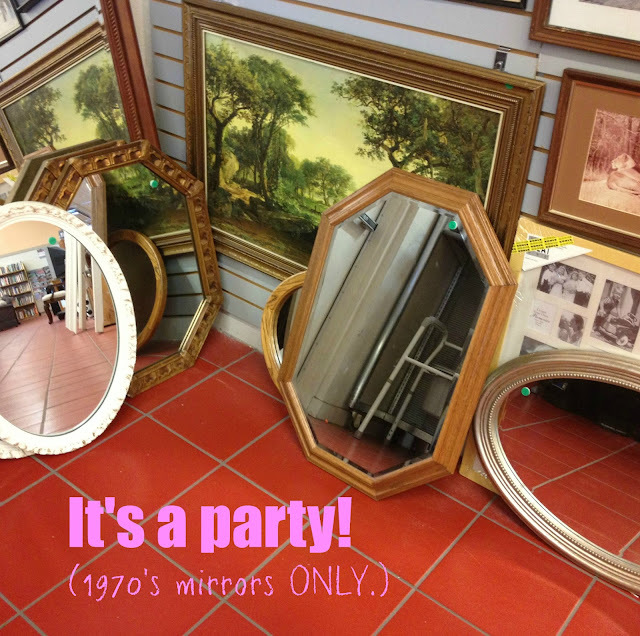 I've also gotten most of the mirrors in my house from thrift stores (like the one in my closet). 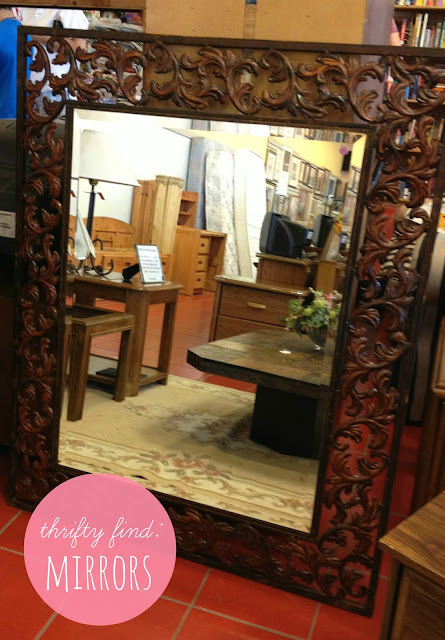 Sometimes, I come across mirrors that are way more unique than anything I could find in a retail store. Just remember to focus on the shape of the frame. You can easily change the color of the frame with spray paint or rub and buff. Thrift stores are a glass vase paradise. 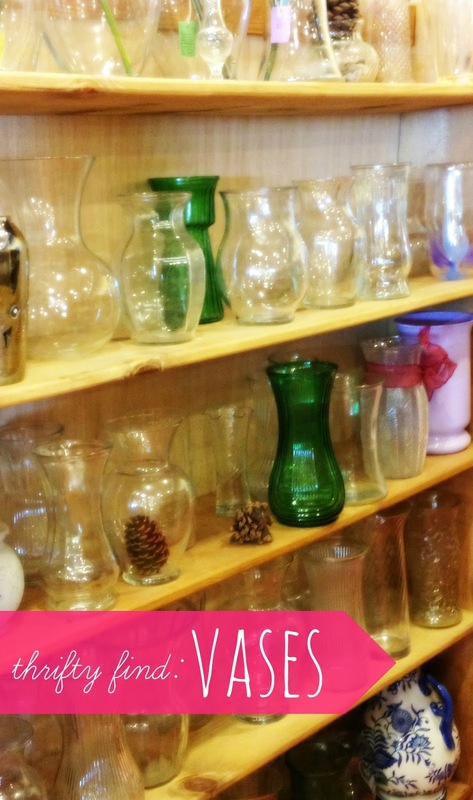 I can usually find them for $1-$2, and often times they are exact replicas of basic glass vases you would spent $10-$20 on elsewhere. My favorite thrift store loves to sprinkle pinecones in the vases. I feel like it's the same strategy as Crest attaching a mini mouthwash to the toothpaste box. Like maybe I'll try out that pinecone and come back for more. 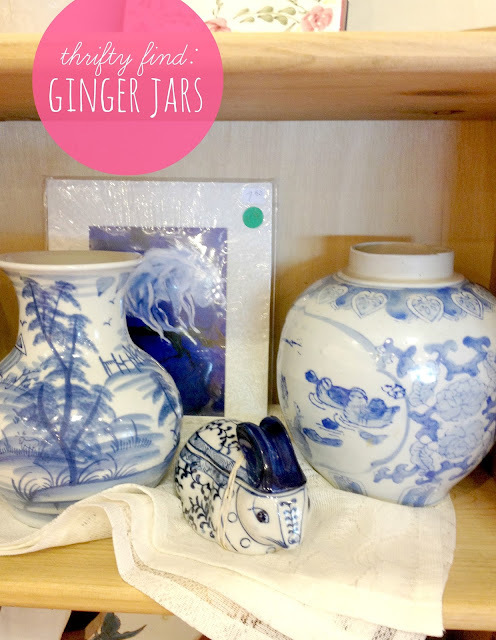 I love to look for blue and white porcelain at thrift stores. Ginger jars are one of my favorite finds. Some are better than others, but every so often I come across a really great looking one. This peacock vase was actually something I brought home. I'm pretty sure the peacock straight up seduced me. 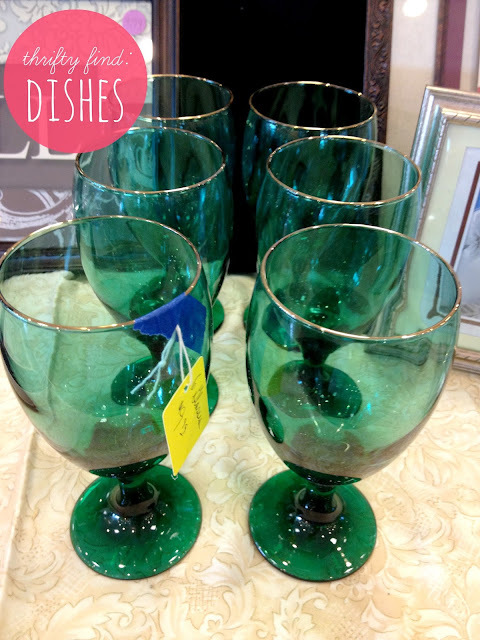 As you can see in this post, my kitchen cabinets are filled with colorful dishes that I usually find at thrift stores. I find really unique dishes all the time. For example, I love these crystal emerald glasses with gold rims, at just $9.99 for all 6. 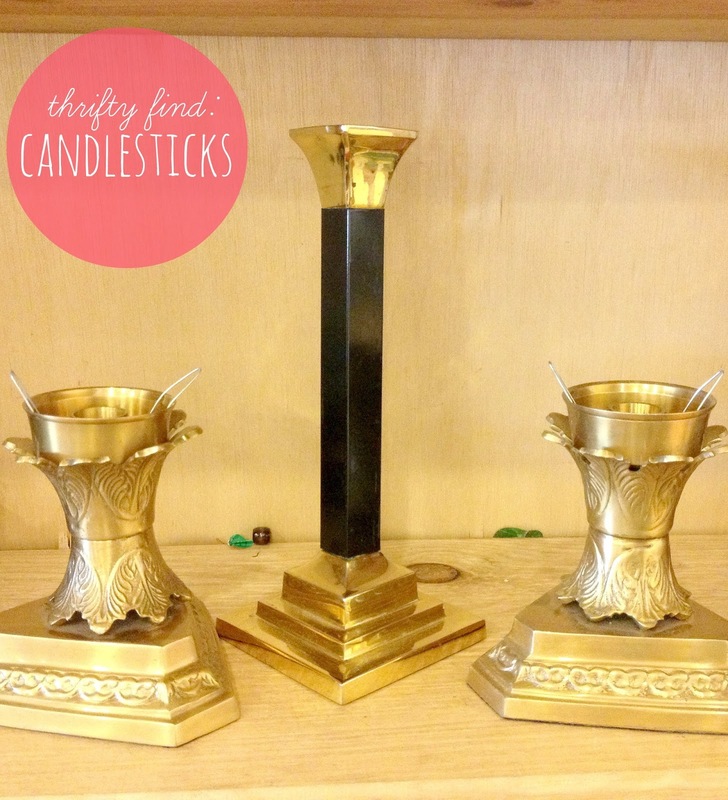 Those would look fabulous on a bar cart. 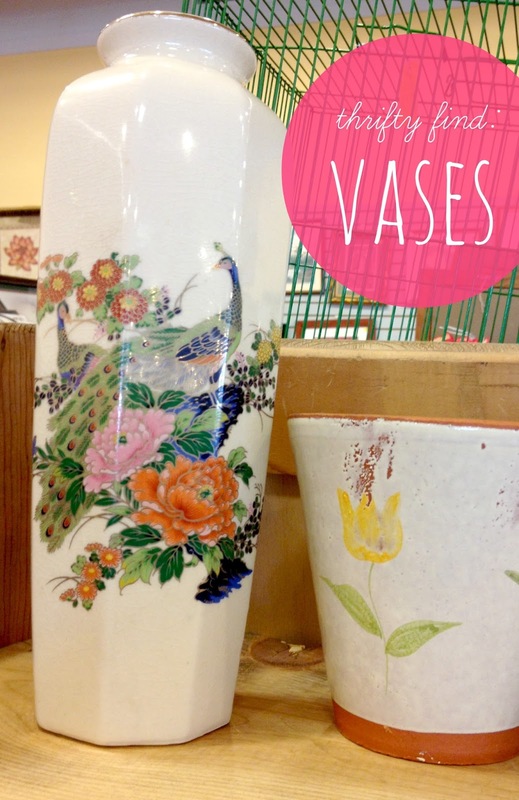 Thrift stores are great places to find fun little accessories to style up your home. 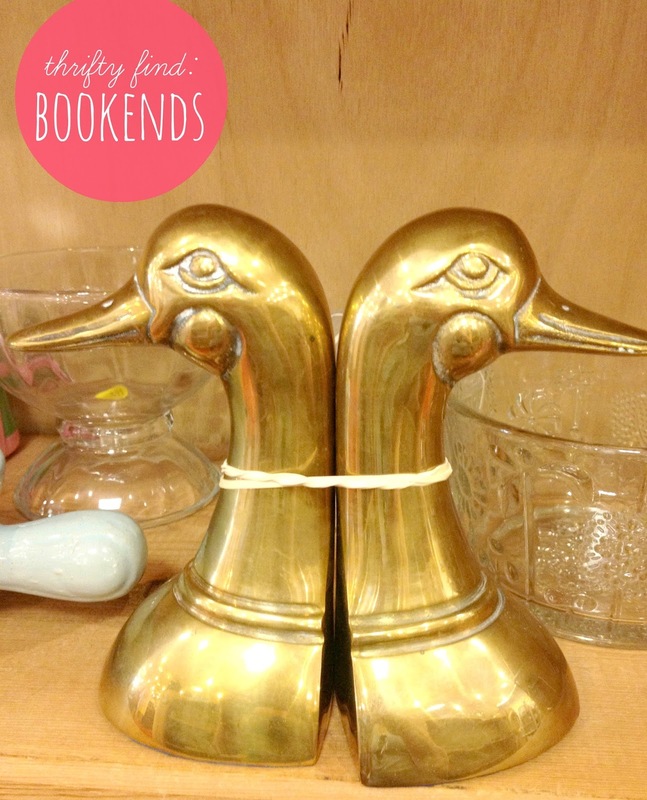 These brass bookends would look great on a desk or bookshelf. Some say that any decor in the fowl family is totally passé but I squawk at the mere suggestion. These little fellas could join my nest anyday. Officially tally: That's two bird-puns. 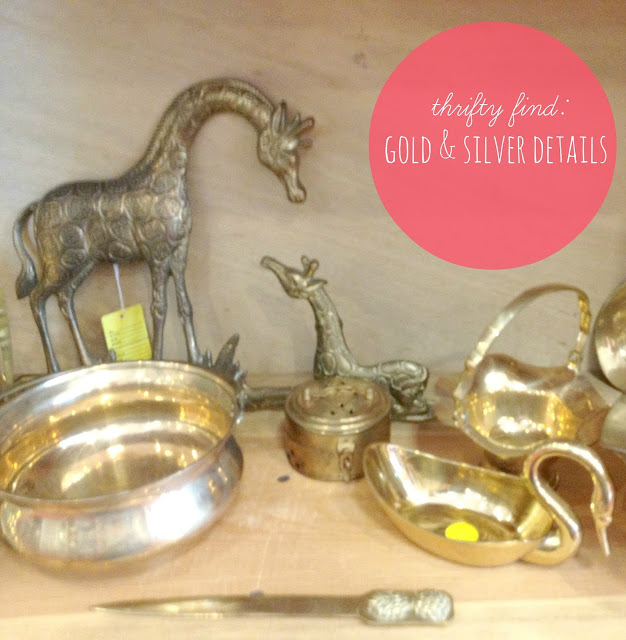 As a general thrift store rule, I find tons of gold and silver trinkets. I think the 2 giraffes in the below picture would be super cute in a nursery. I would frame each one in a shadow box and add them to a gallery wall. I also like the silver bowl and the tiny silver thing with the latch on it. I have no idea what that is, but it appeals to my love of miniature things. 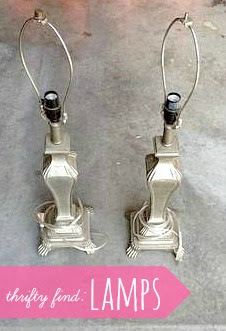 Candlesticks are another common item found at thrift stores. They tend to all be brass or glass and circa 1985-1992, but sometimes you can find a little diamond in the rough, like that art deco one below. You could leave it as-is or spray paint the entire thing one color. So, those are my 10 things you can find at thrift stores. and after a lot of paint and some thrift store shopping it now looks like this. 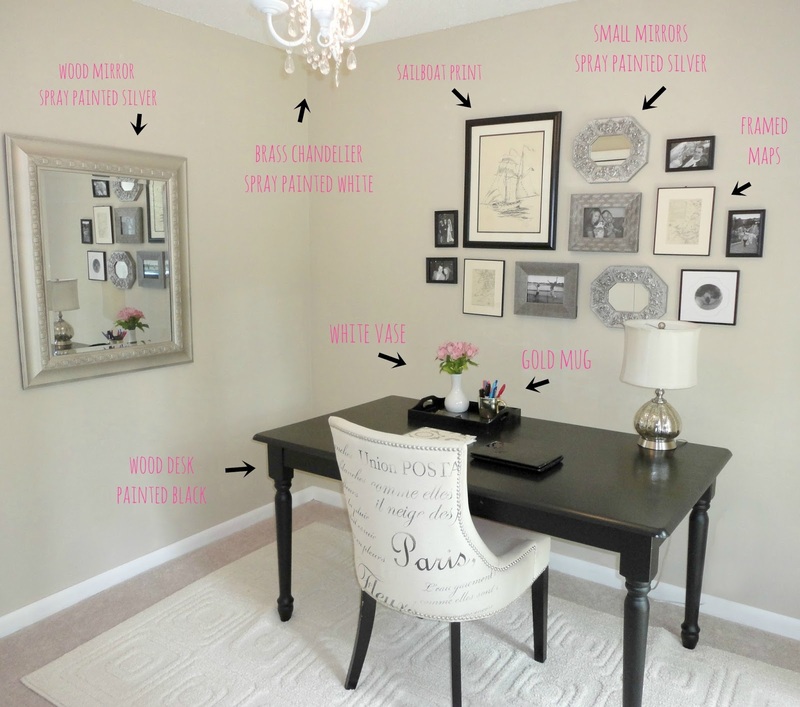 I don't expect to see this room in a magazine anytime soon, but I do think it's a great example of how you can incorporate thrift store finds into your decor. 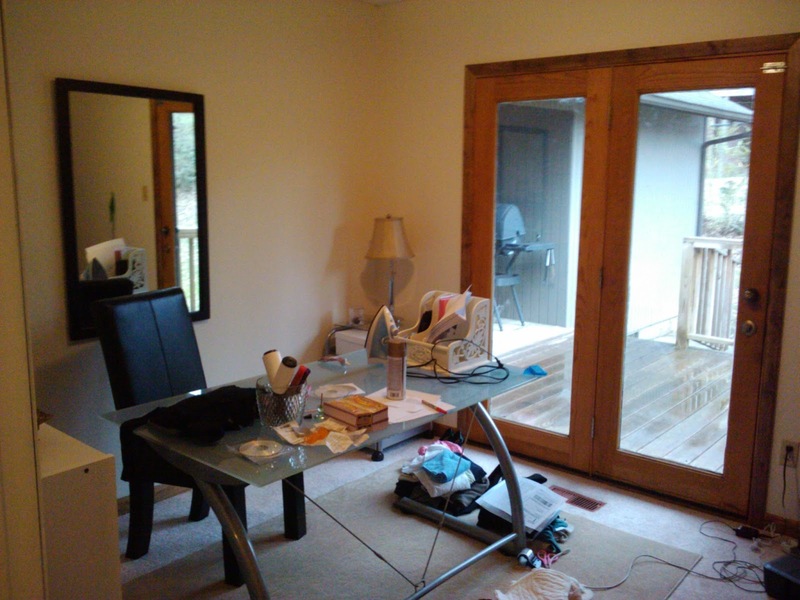 I did this entire room for less than $400, and all of the below items with arrows were secondhand (either thrift store, craigslist, eBay, or garage sale). I've found (through all my many failed decorating attempts) that it helps to mix the old and the new. So, I brought in a new chair and rug, and added a few updated accessories like some of the frames on the wall, and the curtains. Some of the accessories I love the most came from the thrift store though, like the little gold mug that I now use to hold my pens (previously seen here), the little white vase, and the old wooden tray that I spray painted a high gloss black. Go forth, thrift, and report back!